The entire city of Cleveland is riding high. The Browns trashed their bitter rival on a perfect October day and it was a long time coming. Years of frustration alleviated by a hometown hero, leading the team he grew up watching to a winning record. It just doesn’t get much better. 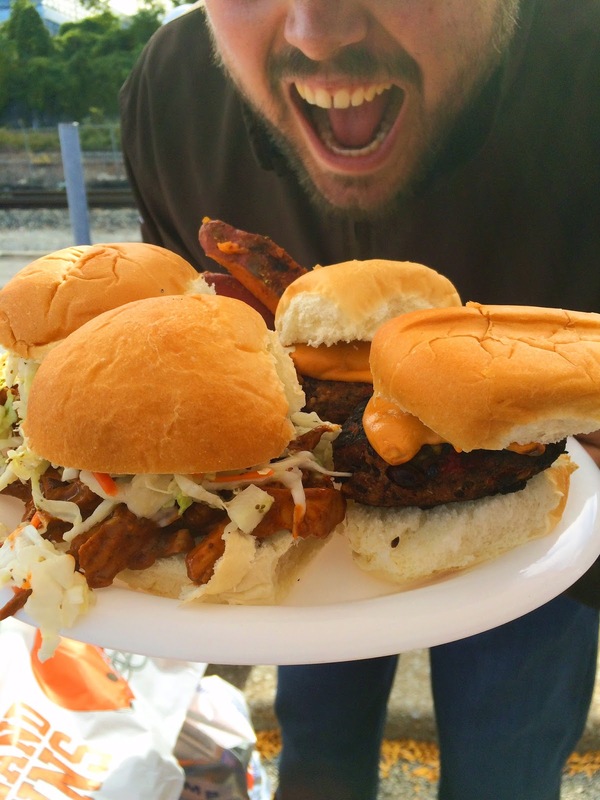 Actually, it does get better if you were able to join us at the muni lot today and sampled these stuffed veggie burgers. The creamy avocado center took it to another level. 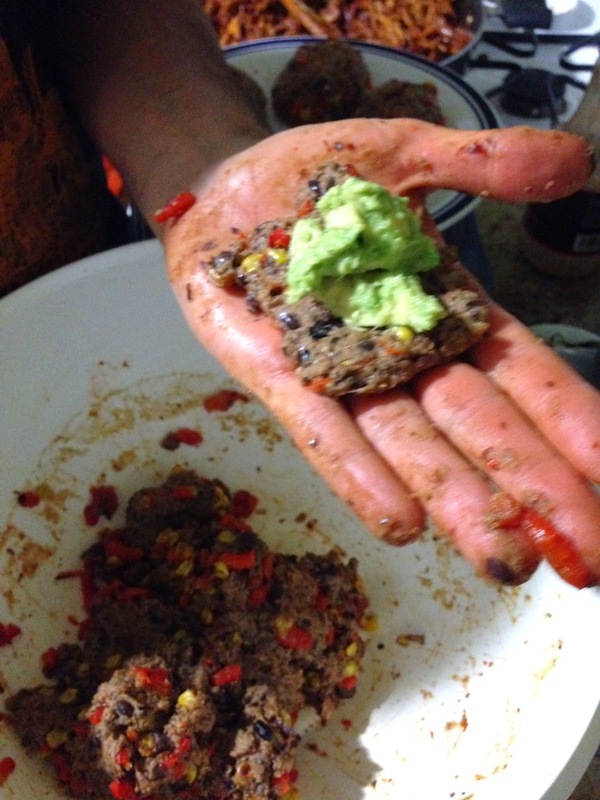 The recipe for the burgers has been in development for a little while now. I made very similar patties for a memorial day cookout and they were gone in a flash. 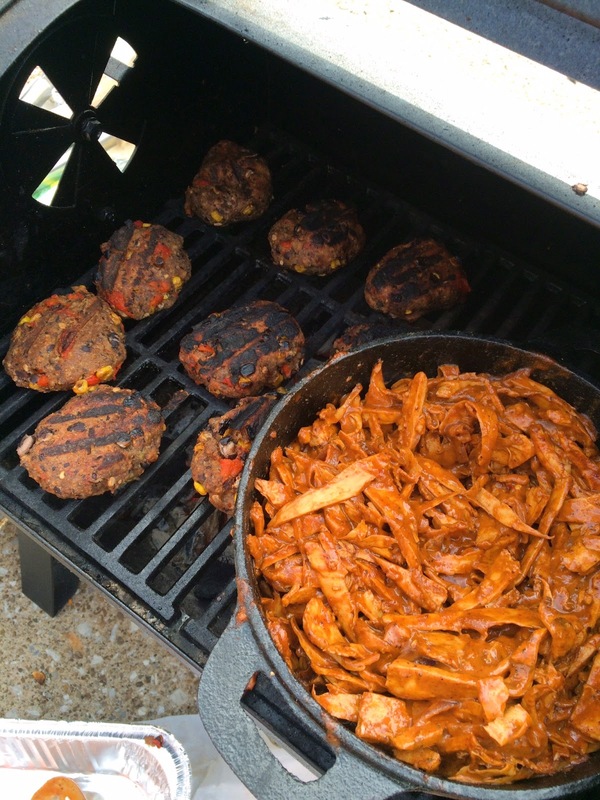 Its a combination black bean and seitan base so it holds up very well on the grill. 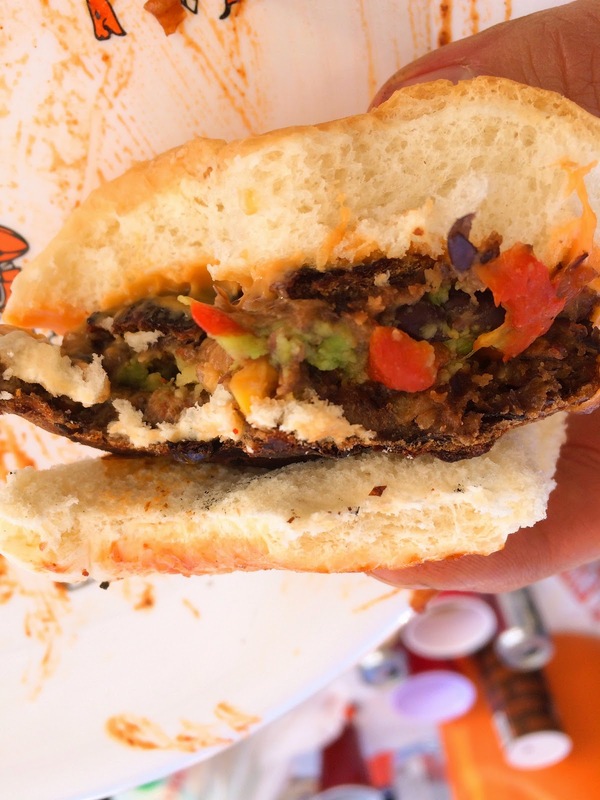 The last thing you want it a mushy veggie burger falling through the grill grate. And stuffing a burger? I mean, everyone likes a little surprise inside of things, right? 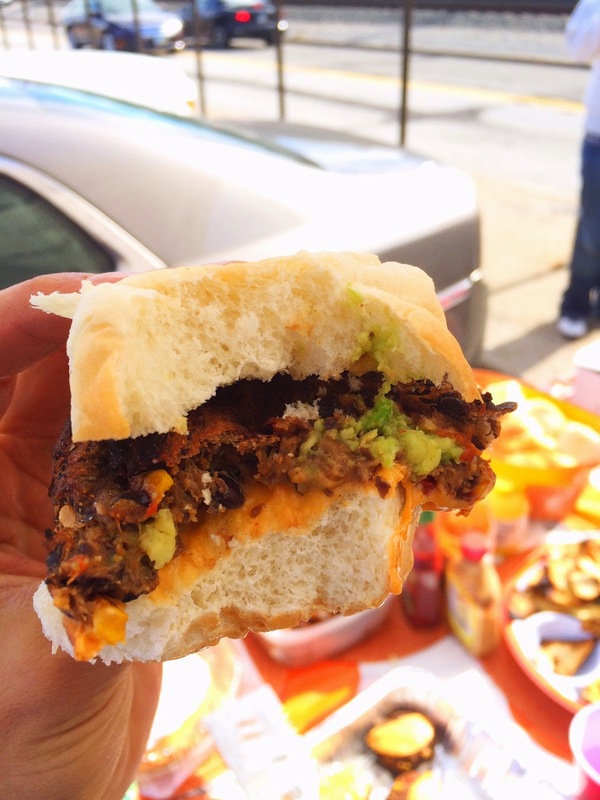 You wouldn’t expect to find avocado in a grilled burger but you’ll be blown away at how well it works. Don’t be afraid to experiment with other fillings too. Preheat oven to 425. Place the corn and red pepper in the oven for about 20 minutes. Watch the corn, you don’t want to burn it! Meanwhile, mash, blend or process the beans. They should be mushy but with some chunks. Add the beans, flax eggs, Worcestershire and soy sauce to a large bowl. Mix well. 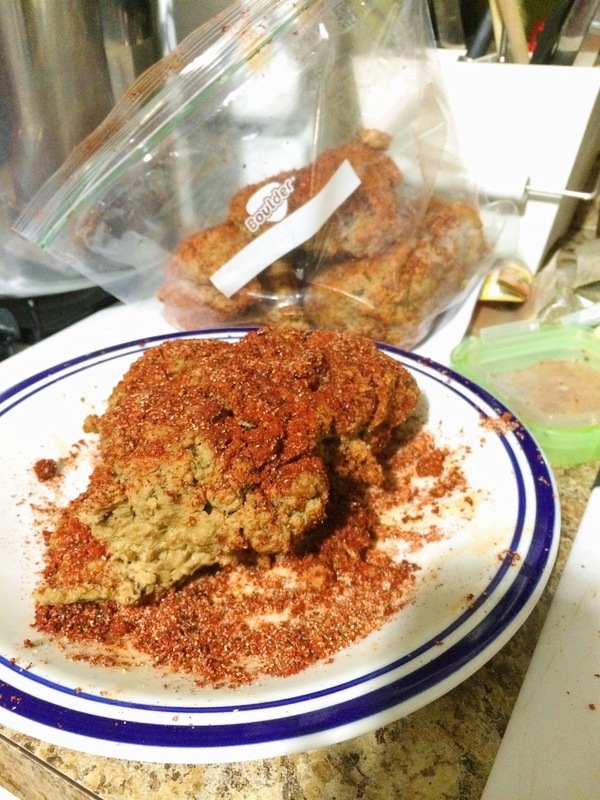 Then add the wheat gluten, bread crumbs and spices. Knead well, about 3 minutes. 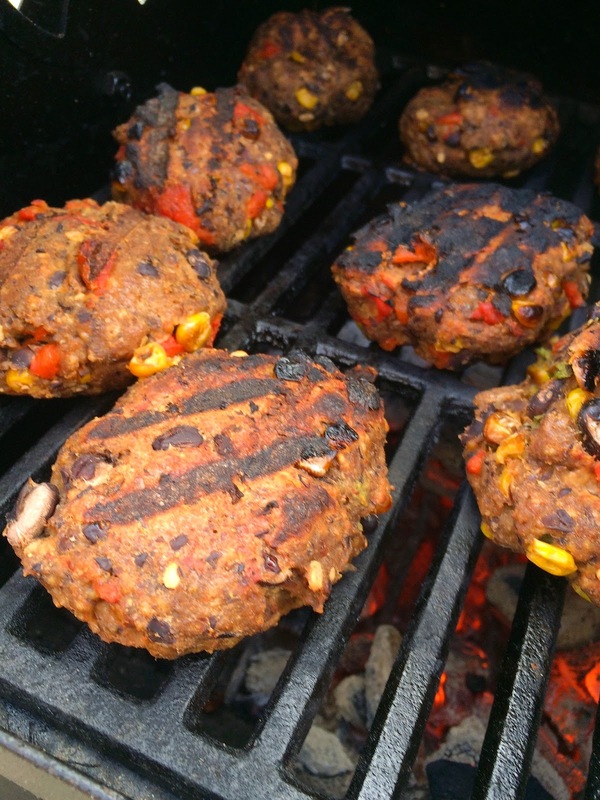 Keep the stuffed patties until ready to grill. Once the grill is ready, grill each side until browned. Toss the cheese on to melt. Serve on a slider bun. It feels good to be back! The Browns decided to show up this week and bring home a win. The weather was perfect for grillin and we got down. 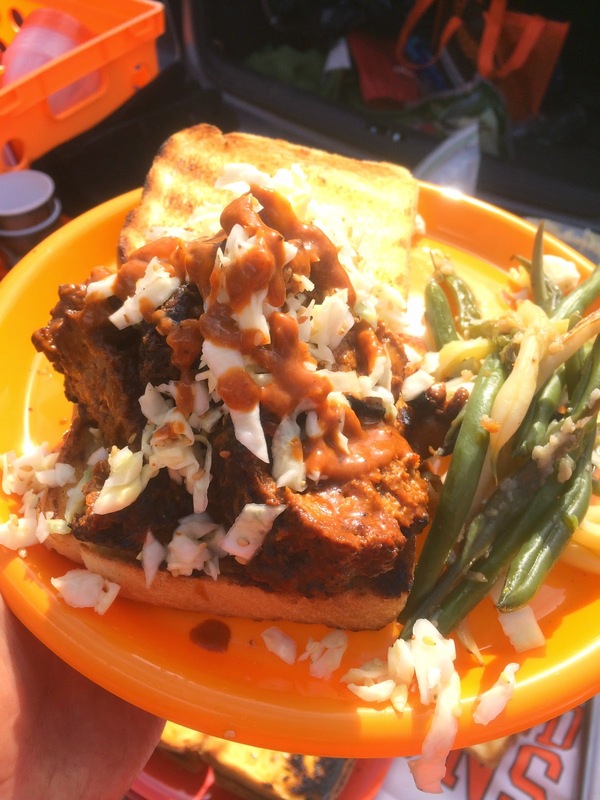 The vegans took over the muni lot with an outta this world vegan tailgate. 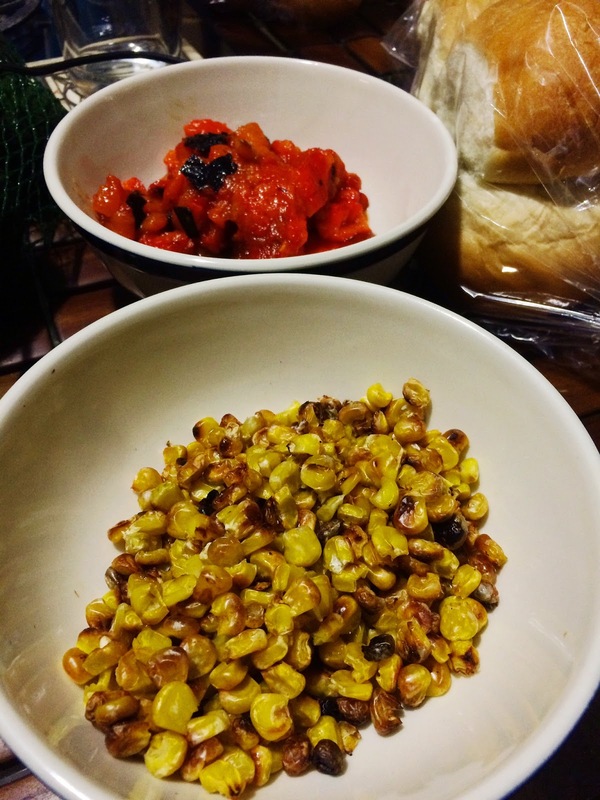 Cowboy Caviar, Mac and Cheese, Green Beans and more. This brisket recipe requires a bit of advance prep. 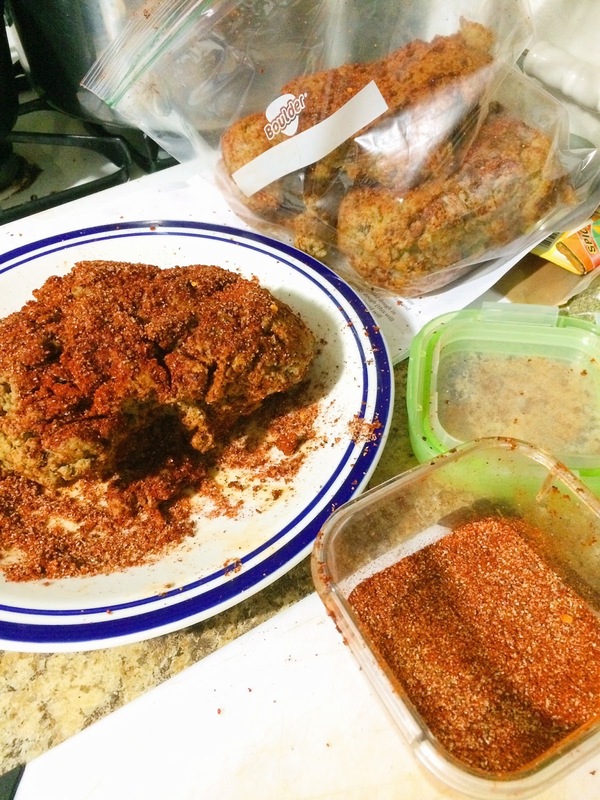 Form and boil the brisket the night before and coat with a dry rub. On game day, use your favorite BBQ sauce or make your own (I will post my BBQ sauce recipe later this week). I went ahead and put the brisket, along with a simple cole slaw, on grilled Texas toast for a loaded sandwich. 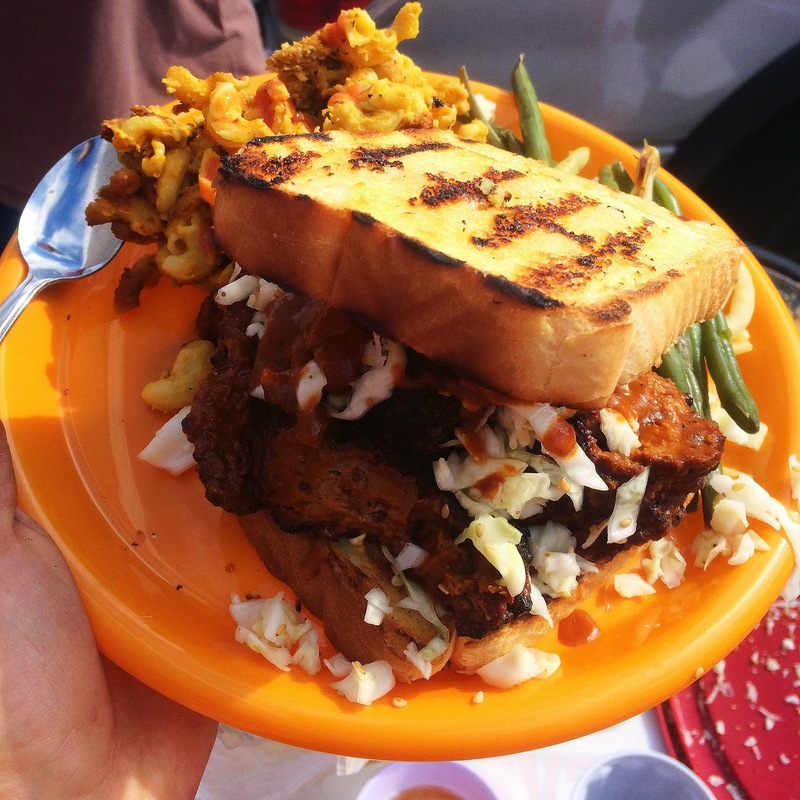 I drew inspiration from my two favorite vegan food trucks, Homegrown Smoker in Portland and BBQ Revolution in Austin. They are worth following and be prepared to drool at every post! Now onto the brisket! 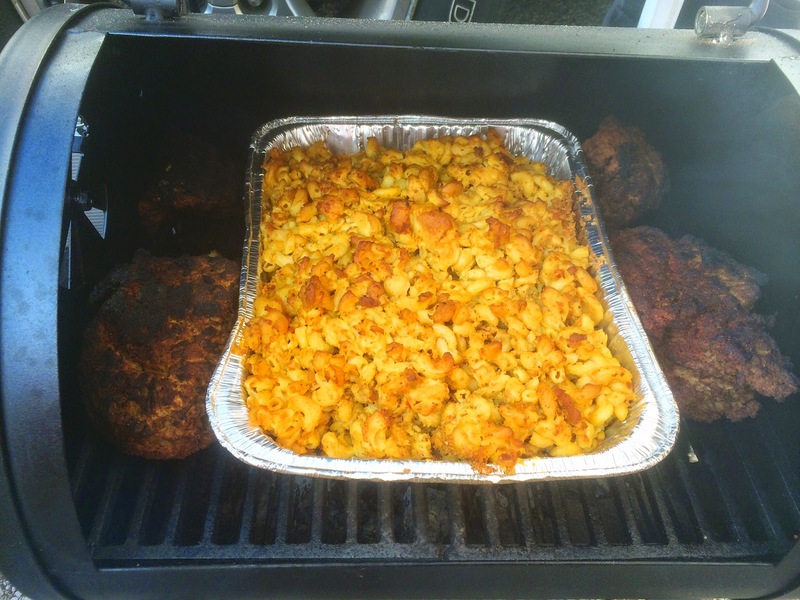 Smoking can be accomplished in many different types of grills. I used the simplest method in my new horizontal grill. By sprinkling the charcoals with soaked wood chips and using indirect grilling, you can smoke the brisket “low and slow.” This recipe will knock the socks of your guests. Enjoy! Combine dry ingredients (gluten, nutritional yeast and spices) in a large bowl. In a separate bowl, mix together wet ingredients (water, soy sauce, ketchup, garlic, and lemon zest). Pour the wet ingredients into the dry and combine. Knead dough in the bowl for about 3 minutes until you have a spongy dough. Let rest for a few minutes, then shape into a log about 7 or 8 inches long. Cut into 3-4 pieces. Squeeze out all the liquid you can, without breaking it up (some pieces will fall off. Save these for stir fry, meat sauce, or some other use). Combine all of the spices in tupperware. Shake! Coat each piece of brisket, being careful not to break any. Really rub it in. Wrap each piece in plastic wrap or place in a Ziploc bag and refrigerate for several hours or overnight until ready to smoke . Soak wood chips (I like hickory) for 45 minutes or more. Place the brisket on the grate. Throw some wood chips on the hot coals and close the cover. Smoke for 1 to 1 and a ½ hours, adding more soaked wood chips occasionally. Baste with bbq sauce in the last 20 minutes. Slice and coat with BBQ sauce. Place cabbage in a large mixing bowl. Place vinegar in a heavy saucepan and bring to a boil. While vinegar is boiling, slowly add sugar and salt, stirring constantly until dissolved. Turn off heat. Place pinch of white pepper in a mixing bowl. Slowly pour vinegar mixture into white pepper while whisking, and mix well. Cover. Sprinkle celery seed and sesame seeds over cabbage and mix thoroughly. Add vinegar mix and combine well. Mix together the Earth Balance and garlic in a bowl and season with salt and pepper to taste. 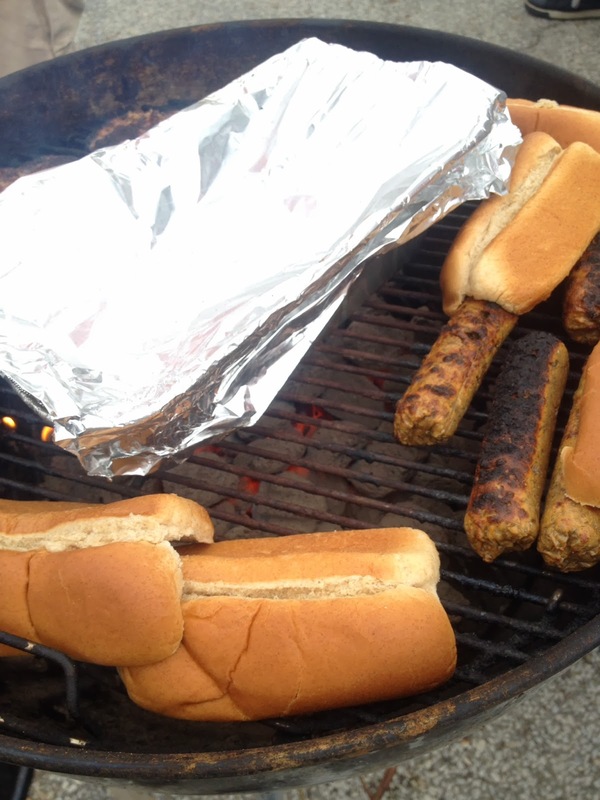 Brush one side of the bread with the Earth Balance mix and place on the grill, spread side down. Grill the bread for 1 to 2 minutes until lightly golden brown. Flip and quickly toast the dry side. The Browns were dealt a low blow losing hometown hero QB Brian Hoyer last week to a season ending knee injury. Back comes Brandon Weeden and he precedes to make “the worst interception of all time.” All joking aside, this is kind of what we come to expect from the Browns, year after year. So what do we rely on? The tailgate. And it was one of the years best. Perfect fall day and people in good spirits. I decided to make vegan sausages for the 3rd time. I had a couple practice rounds before trying it out at the tailgate. People tend to grimace when I tell them my sausages are vegan, but honestly do they even know what kind of meat is in a “normal sausage?” Probably better they don’t know. While some don’t want to know how the sausage is made, I’m ready wax poetic about how to make these delectable vegan apple sage sausages. Fall means apples in Ohio and across the midwest. A trip to an apple orchard with my girlfriend left us with a huge bounty of several varieties of apples. I made sure to get a number that were good for baking and making sauce. By cooking down the apples, I made a plain jane apple sauce (just water and apples) to use in recipes, including the one below. The technique is similar to the All-Pro Veggie Burgs, where you knead wheat gluten with wet ingredients, wrap in foil and then steam. Afterwards, the sausages can be refrigerated until they are ready to grill. 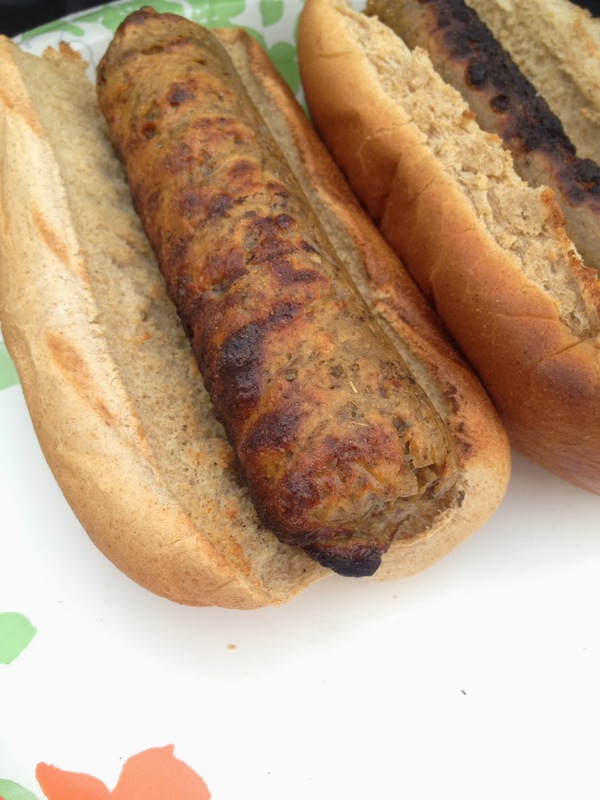 Next time I might use a bit less wheat gluten to make the sausages more moist. The flavor was incredible though and people were impressed. We even topped them off with some polish stew for an authentic taste. Enjoy! 1. Combine the dry ingredients in one bow and whisk the wet ingredients in another bowl. 2. Mix the wet and dry ingredients together and knead for about 5 minutes. 3. Pull off a small clump of the dough and roll into a log. It should be the size of a sausage! 5. Steam for 40 minutes in a steamer or a pot/pan with a steamer basket. 6. Remove and refrigerate until ready to grill. 7. Grill on an oiled grill grate for 5-7 minutes. Thanksgiving is about two things: food and football. 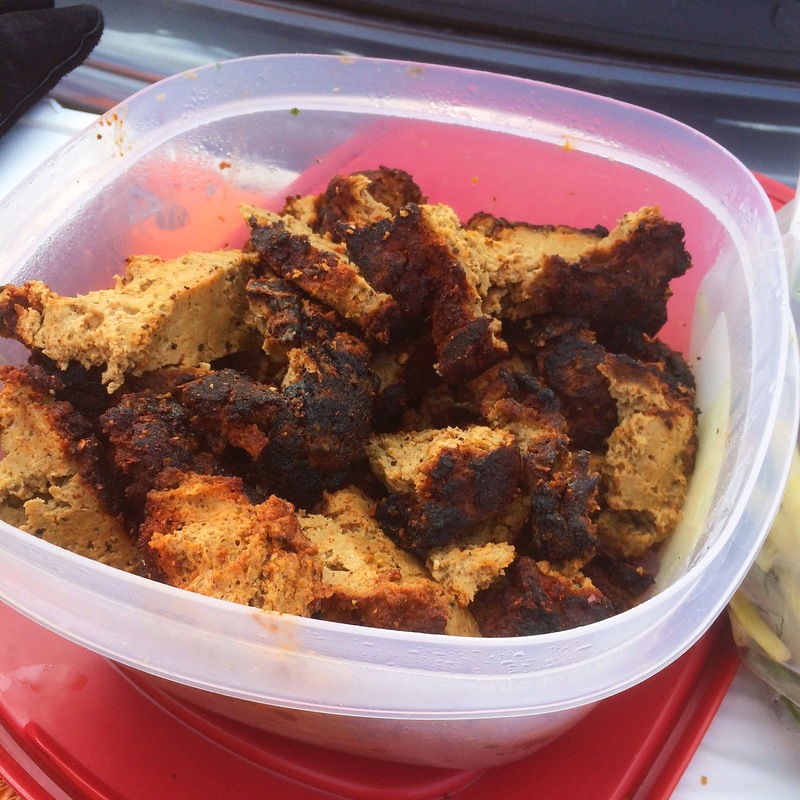 I debated doing a Thanksgiving post because its usually eaten indoors and not in a parking lot, but the distinctions from tailgating end there. You gather around with friends and family to eat a lavish meal, watch football, drink a few drinks and have a good time. Just like a tailgate! 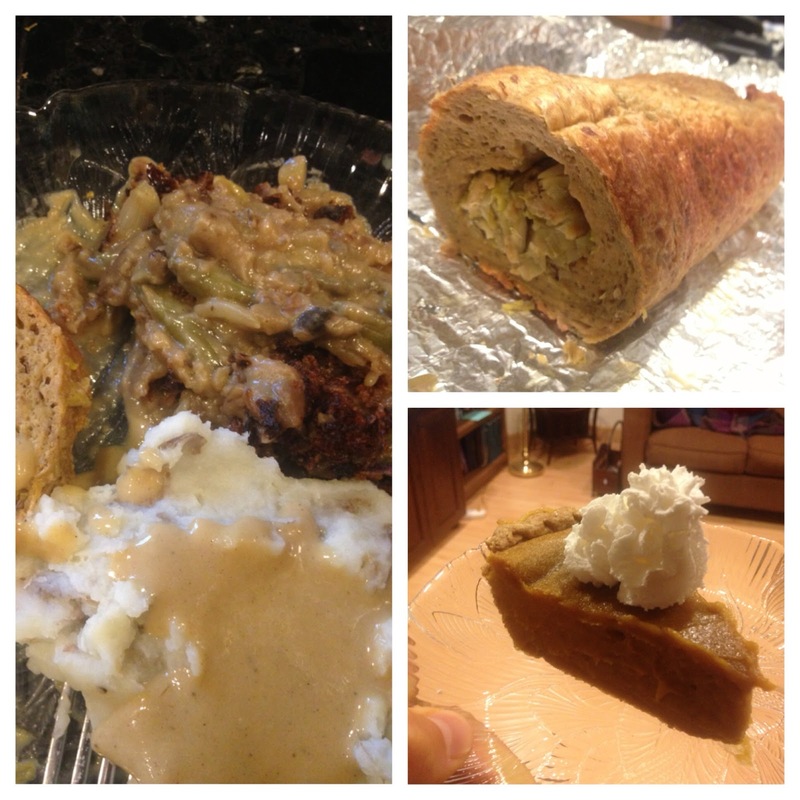 I’ll be the first to confess that this is my first vegan Thanksgiving. Last year I made an exception to the rule and ate turkey and all the fixins. But this time around I was determined to give it a go plant based. Plus I had a road game Sunday in Dallas (nothin says Thanksgiving like an almost win against the Cowboys) to allow me to cook from home and test out some new recipies. I pulled recipes from one of the most respected and creative vegan chefs around to create a complete feast. Isa Chandra Moskowitz is a personal hero of mine for her endless pursuit of delicious food. Her show, Post Punk Kitchen, spawned a book, which spawned a blog, which spawned many more books, is an inspiration to vegans everywhere. 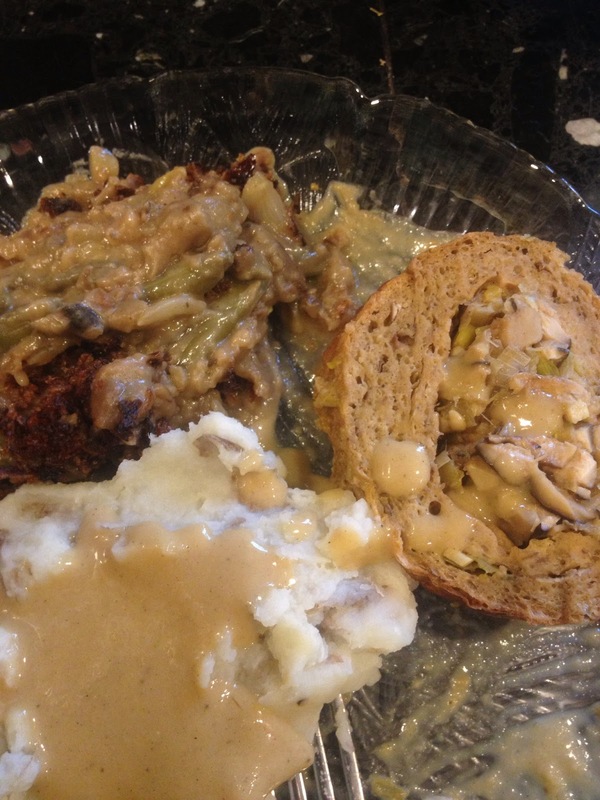 Here’s the menu: Seitan Roast Stuffed With Shiitakes And Leeks, Green Bean Casserole, Mashed Potatoes with Golden Gravy (from Chef Chloe) and Pumkin Pie (from Kathy at Lunchbox Bunch. This Thanksgiving post has nothing on hers). Enjoy! 1. Preheat a large pan, preferably cast iron, over medium heat. Saute the mushrooms and leeks in oil until soft, about 10 minutes. Add salt, pepper, garlic and thyme. Cook for about 2 more minutes, stirring often. 2. Sprinkle in the breadcrumbs and toss to coat. 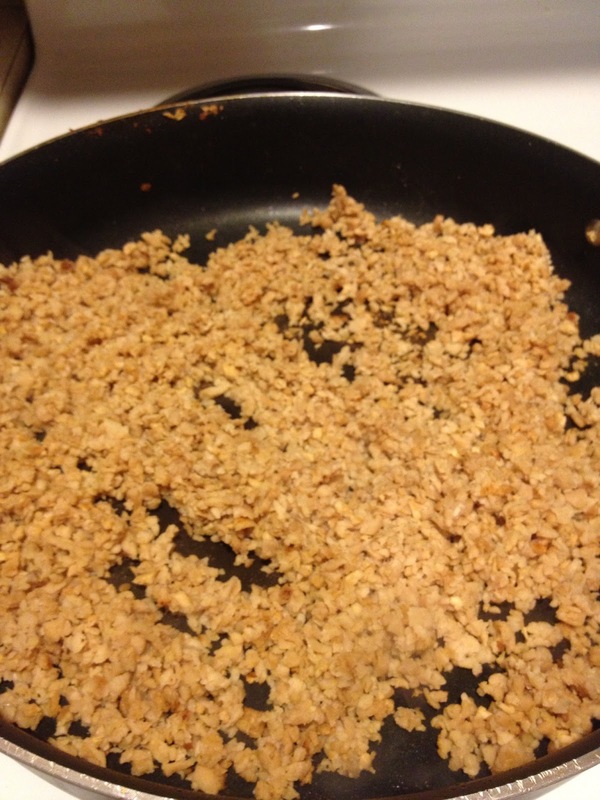 Cook the mixture, stirring very often, until the breadcrumbs are toasty and the mixture is relatively dry. This should take about 5 minutes, and the breadcrumbs should turn a few shades darker. 3. Drizzle in the broth and lemon juice and toss to coat until moist. If it still seems dry drizzle in a little extra olive oil. Set aside until ready to use. 2. In a large mixing bowl, mix together the wheat gluten, nutritional yeast, herbs and spices. Make a well in the center and add the bean mixture. Stir with a wooden spoon until the mixture starts coming together to form a ball of dough. Knead until everything is well incorporated. 3. 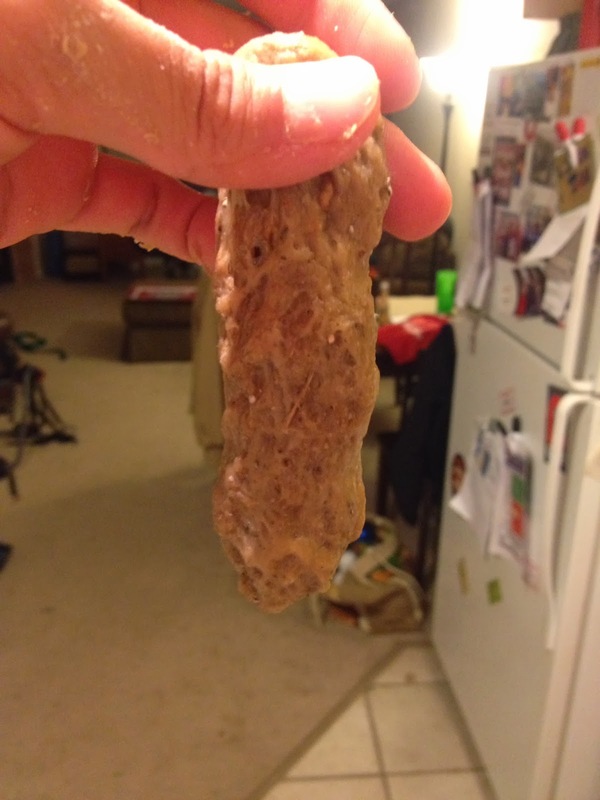 Now we’re going to roll out the seitan and form the roast. Place two pieces of tin foil (about 18 inches long) horizontally in front of you. The sheet further from you should overlap the closer sheet by about 6 inches. This way you have enough foil to wrap around the whole roast. 4. 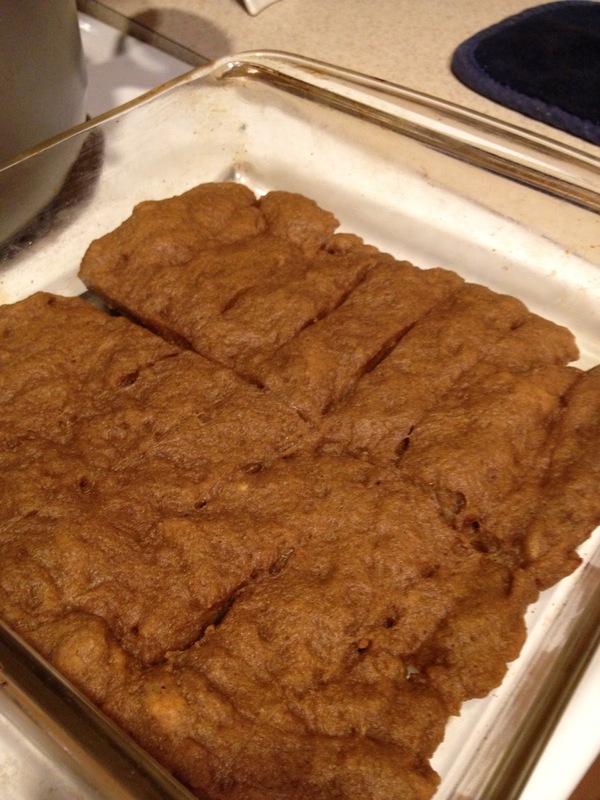 On a separate surface, use your hands or a rolling pin to flatten the seitan into a roughly 12 x 10 rectangle. If any pieces rip, don’t worry about it, just use a pinch of dough from the ends to repair any holes. 5. 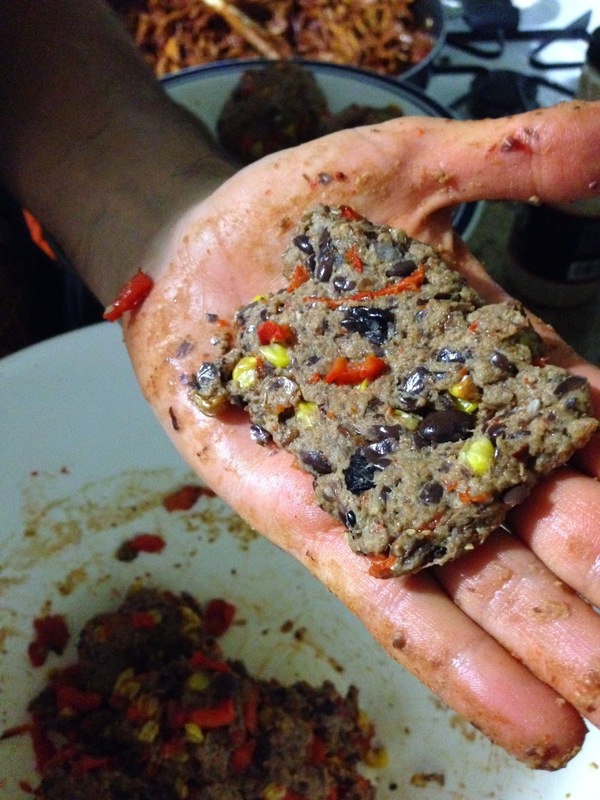 Place the filling in the lower 1/3 of the seitan rectangle, leaving about 2 inches of space at both ends. (Or you could do one thin layer and the filling would be more dispersed. 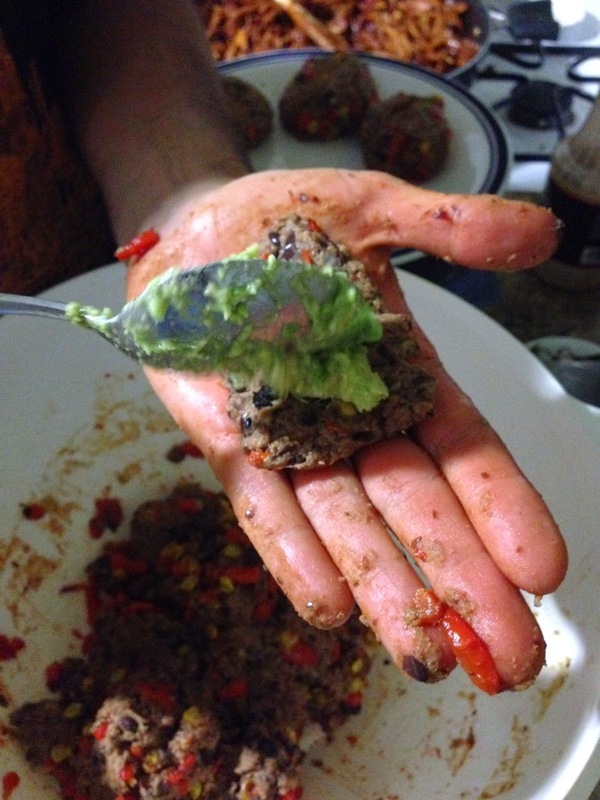 I might try this next time) Make sure the filling is compact, use your hands to form it into a nice, tight bundle. 6. Now roll! 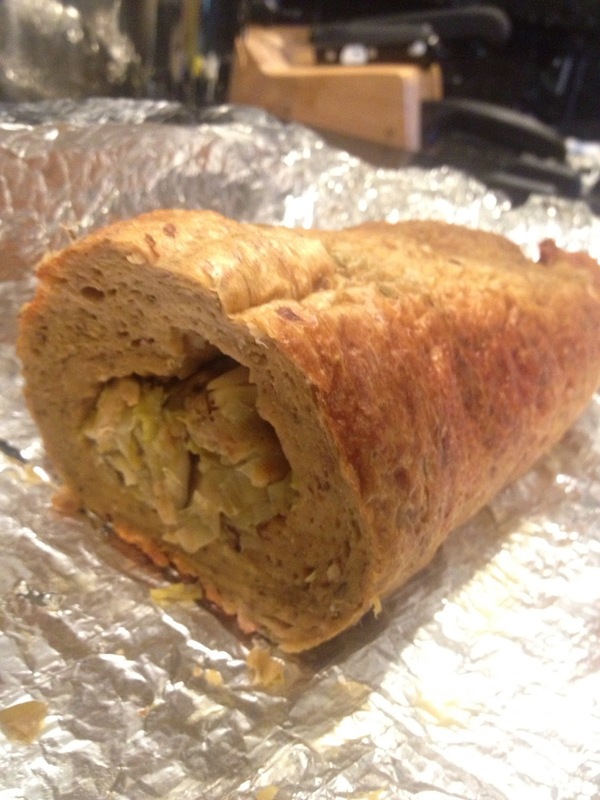 Roll the bottom part of the seitan up and over the filling. Keep rolling until in it’s in a log shape. Now pinch together the seam and pinch together the sides to seal. It doesn’t have to be perfect, it will snap into shape when baking. 7. 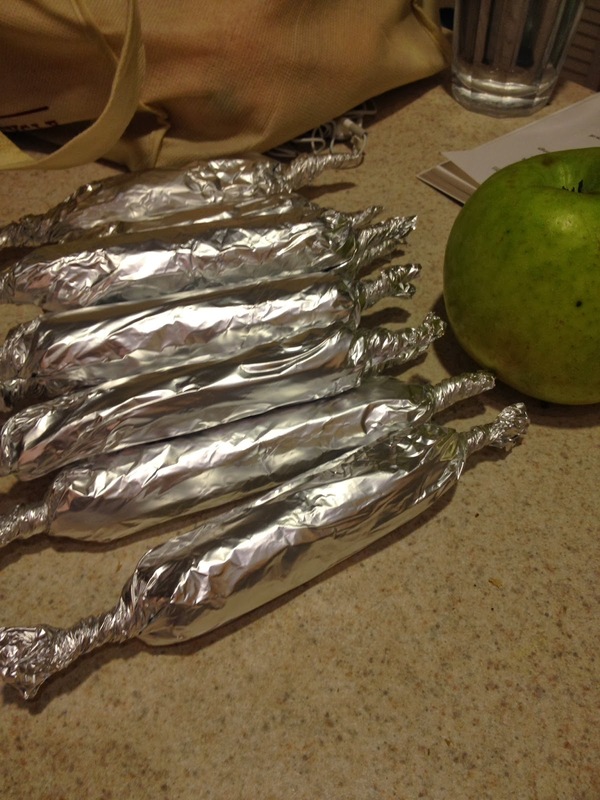 Place the roll in the center of the tinfoil and roll up like a tootsie roll, making sure the ends are tightly wrapped. Transfer to a baking sheet and bake for 60-90 minutes. Rotate the roll every 20 minutes for even cooking. Unlike anything I’ve ever made! 1. Bring a pot of water to boil for the green beans. When ready, boil for about 7 minutes then drain. 2. Meanwhile, in a large pan over medium-high heat, saute onions in olive oil for about 2 minutes. Add mushrooms and saute for 7 minutes more. 3. Mix the flour into the mushroom soup until very few lumps are left. Add to the pan along with the salt, peppers, and, if using, the nutritional yeast and vegetable broth powder. Stir often for about 10 minutes, until thickened. 4. Preheat oven to 375. Add the green beans to the pan and use your spatula chop them up a bit into smaller pieces (roughly in half). Mix in half of the fried onions. Transfer to an oiled casserole and top with the remaining onions. Bake for 22 to 25 minutes, until browned and bubbly. For yummiest results, let cool for at least 1/2 an hour before serving. 1. Cut off top of garlic and drizzle with oil. Wrap in foil and bake for at least 30 minutes at 400. 2. 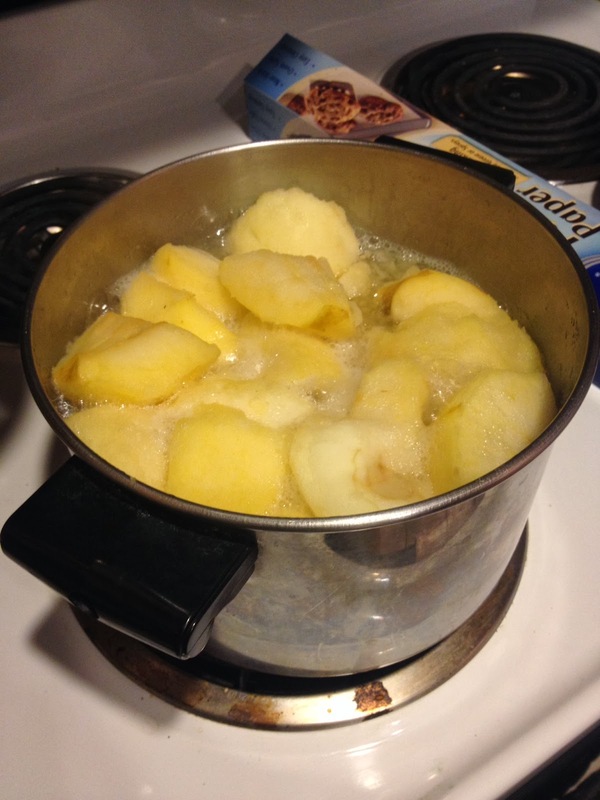 Cut potatoes into about 1 1/2 inch chunks. Place in a pot and cover with cold water. Spinkle about a teaspoon of salt into the water. Cover and bring to a boil. 3. Once boiling lower heat to a simmer and cook for about 12 minutes, until fork tender. Drain potatoes, then place back in the pot. 4. Do a preliminary mash with a potato masher, just to get them broken up. Add milk, garlic, salt and pepper and mash until fluffy. You may want to add a bit more milk, if needed. Taste for salt and pepper and serve! 1. In a medium saucepan, heat oil over medium-high heat and sauté onion until soft. 2. 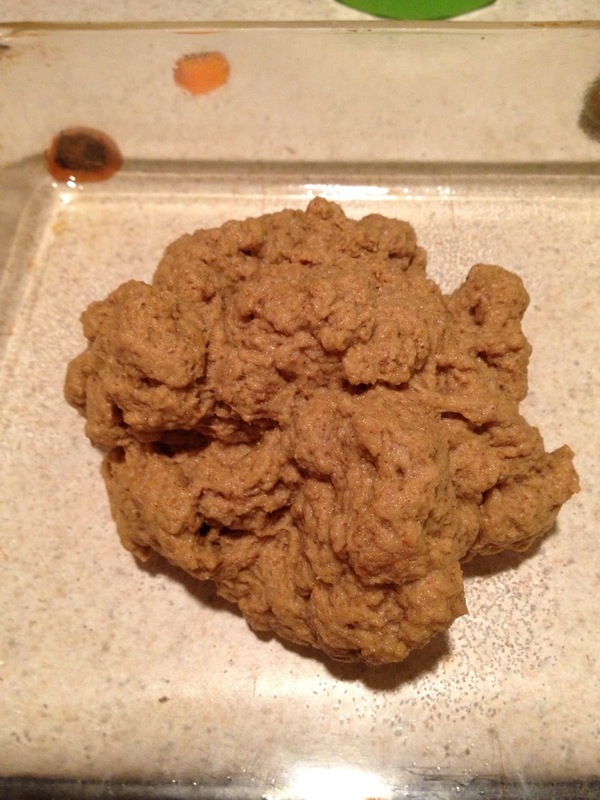 Add nutritional yeast and flour, and stir for about 1 minute. 3. Add water, soy sauce, thyme and garlic powder. Continue to cook, whisking continuously, until mixture is very thick. 4. Transfer gravy to a blender and purée until smooth. Adjust seasonings, and add salt and pepper to taste. 2. Preheat your oven to 400 degrees. 3. Drain the water from your cashews. They should be very soft to bite and a slight purplish dark hue. This is normal. Add 1 1/4 cups of cashews to your food processor – or even better, a Vitamix or high speed blender. 4. Add pumpkin to blender. Next, add in the maple syrup and pumpkin pie spice. Blend on low -> high for about 3-5 minutes until the mixture is completely creamy. If your mixture is a bit thick for some reason – you can add in a few teaspoons of either water, maple syrup or even non-dairy milk. After blending, do a taste test and add a 1/2 teaspoon of salt if needed. 5. Pour your mix into a par-baked vegan pie shell (I toast my raw pie shell in the 400 degree oven for about 8 minutes). You can buy a frozen crust or make your own per instructions linked in recipe above. 6. Bake pie at 400 degrees for 15 minutes. Then reduce to 350 degrees and bake for an additional 30-40 minutes – or until the edges look fluffy and a darker caramel orange tone. Use a toothpick in center if unsure. The tooth-picked filling should come out slightly wet – but very thick and dark. 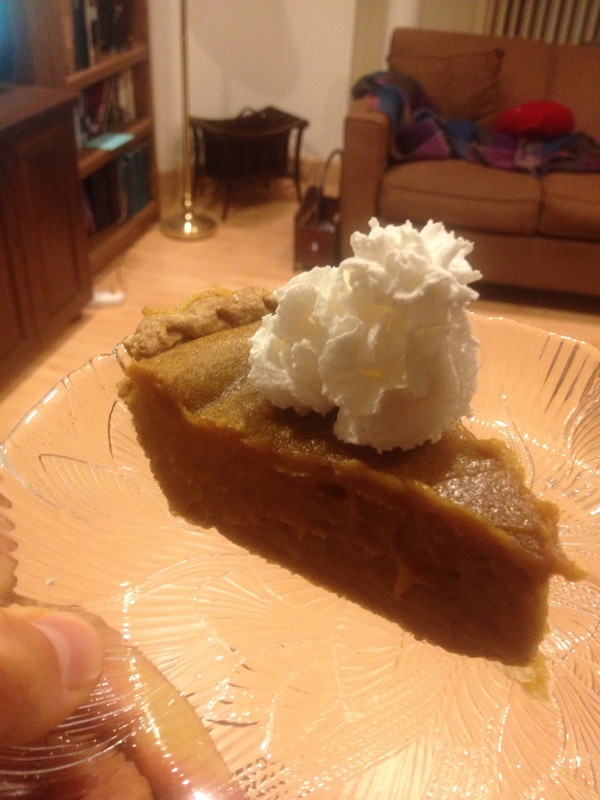 It is important to remember that your pie will firm up significantly upon cooling and chilling in the fridge. 7. Remove pie from oven. Cool on counter for at least 30 minutes. Then place in fridge until ready to serve. At least 2 hours cooling and/or chilling time is my preference. A warm pie will be tasty, but still a bit “wet” to slice. 8. I serve chilled with a spray of Soy Whip on top! 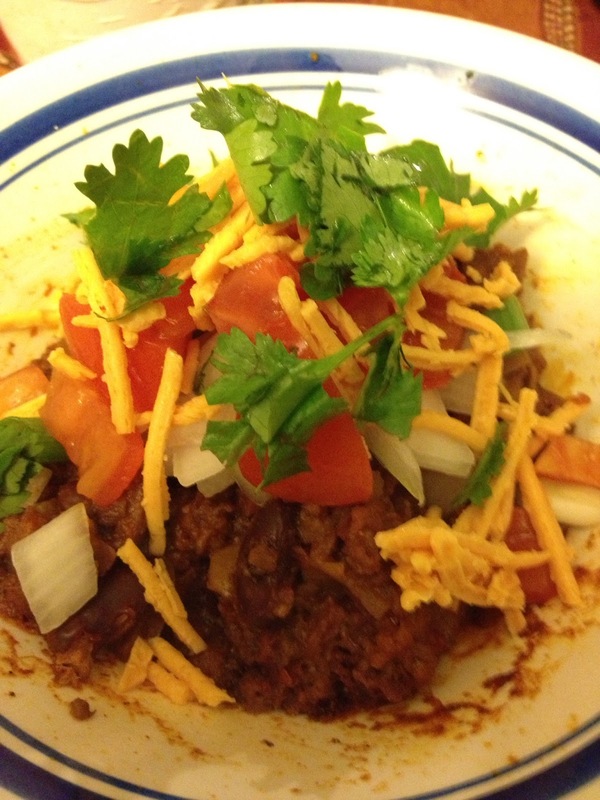 Chili is one of those comfort foods that some meat eaters prefer vegetarian. The mix of beans, veggies and spices lends itself well to any palate. It warms you up, through the heat of the food and the heat of spice. We needed something warm on a cold rainy day in Cleveland. 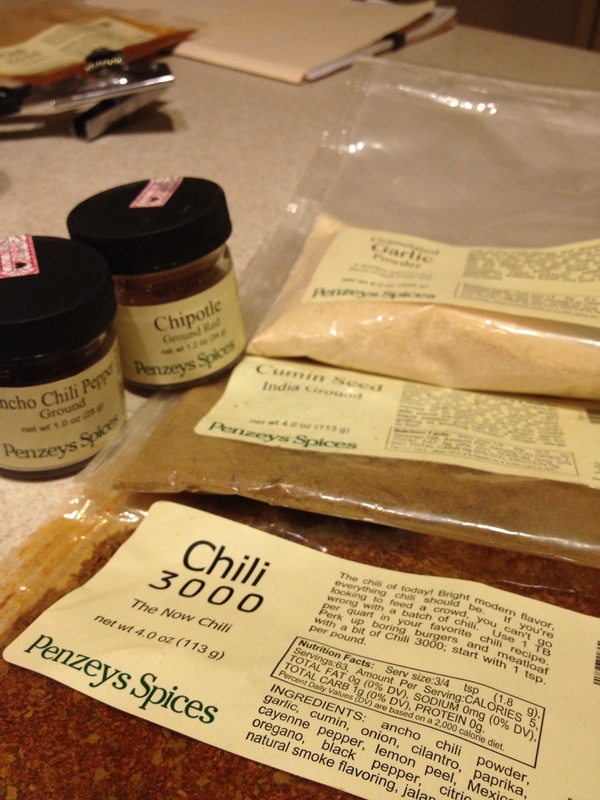 For a tailgate, chili is extremely versatile. We decided to make breakfast burritos and chili cheese dogs for a nice breakfast/lunch combo. Often we dont eat anything but appetizers for the first few hours, so the though of a hearty breakfast burrito is appealing. 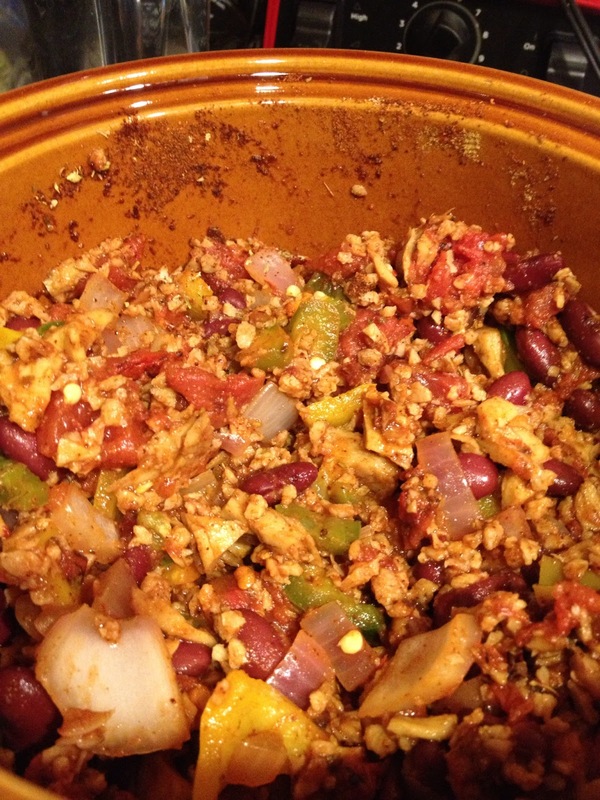 A key to keeping the chili warm throughout the day is either to plug in a crockpot or bring a pot to heat on the grill. 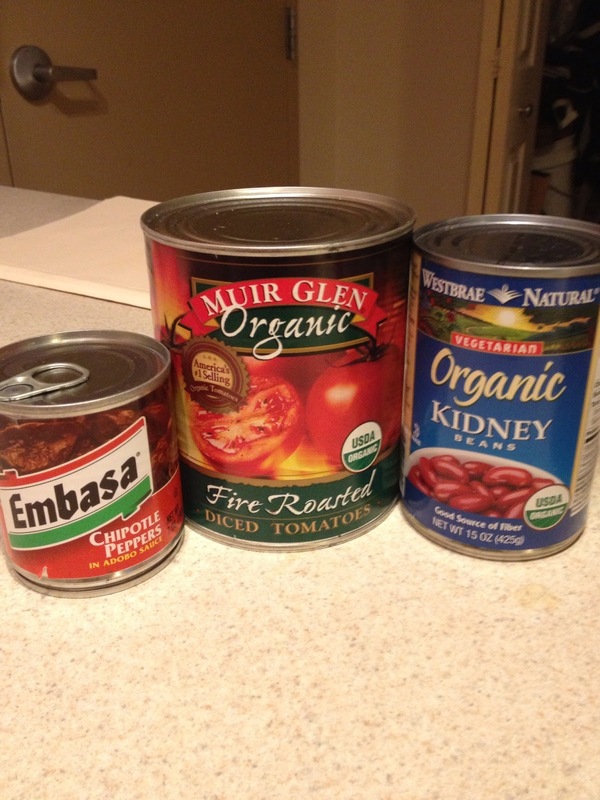 There are two kinds of vegan chili as defined by the Long Star Veggie Chili Cookoff: traditional and all veg. “All Veg” chilis are made with only vegetables, while the “Traditional” chili contain a meat analog or substitute like seitan or tempeh. I opted to make a traditional chili with seitan and TVP, and my buddy Chris made the multi-bean and roasted veggie chili (recipe coming later this week). 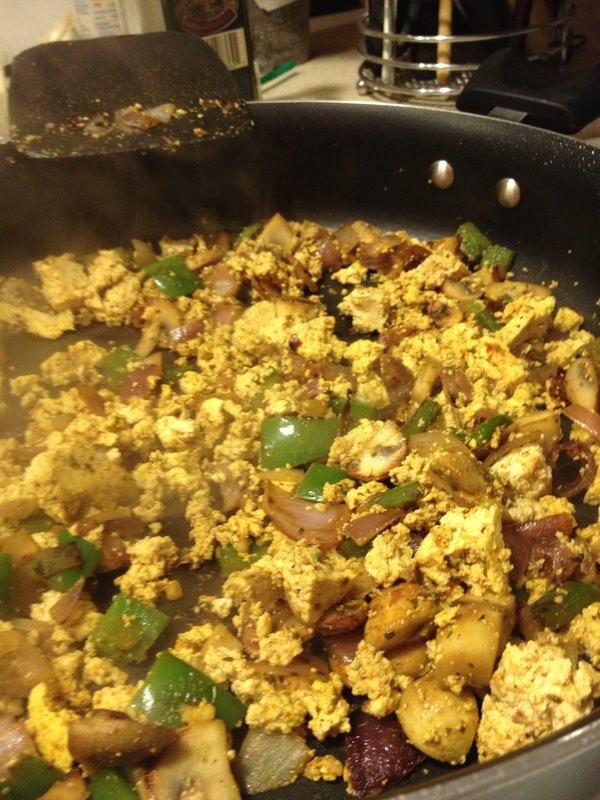 I’ll also include my recipe for tofu scramble for the breakfast burritos. Enjoy! 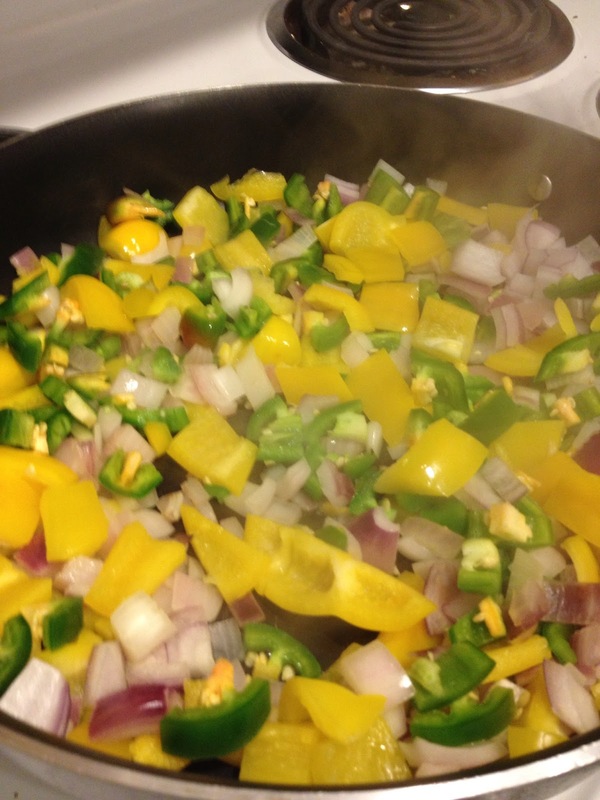 Sautee the peppers, onions and garlic until soft. Toss in the crockpot. The steam burnt my eyes! 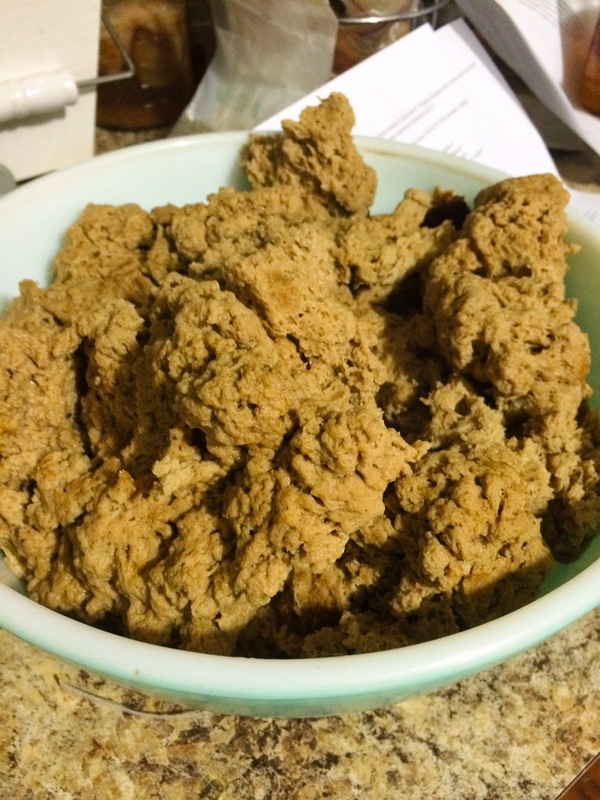 Sautee the seitan until browned. Toss in the crockpot. Reconstitute the TVP by pouring 1 cup of boiling water over 1.5 cups of TVP. Cover and let sit for 10 minutes. Sautee the reconstituted tvp until browned. Toss in the crockpot. Add the tomatoes, beans, chilis, spices, soy sauce, mollasses and stir well. Turn the crockpot on low for at least 5 hours or overnight. 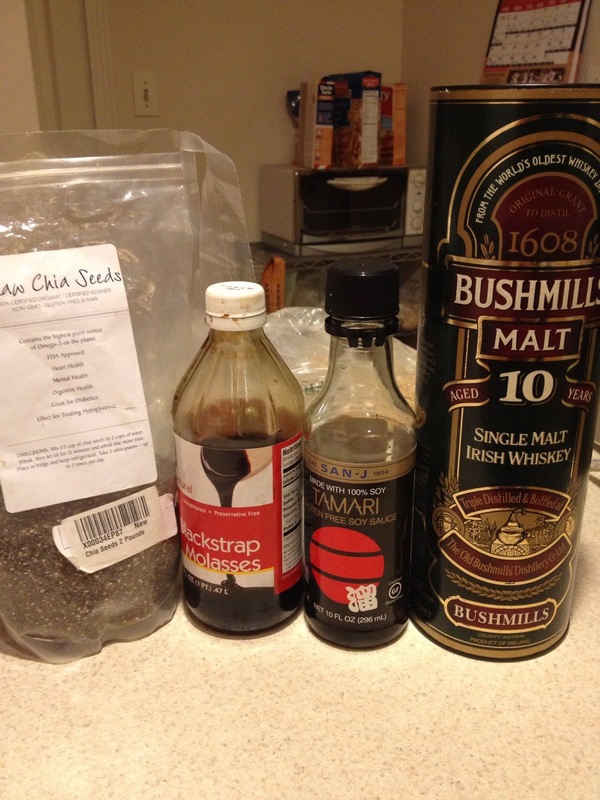 Add the chia seeds and whiskey about 15 minutes before unplugging. Add tomato sauce as necessary if its dry. 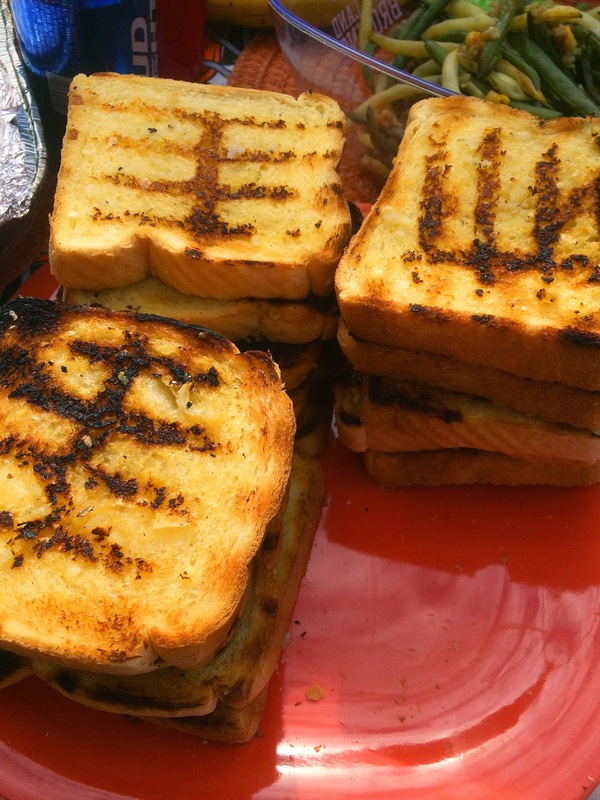 Serve over Field Roast Frankfurters in ezekiel buns topped with Daiya Cheddar cheese. Don’t forget the hot sauce! Sautee the peppers, onions, mushrooms and garlic. 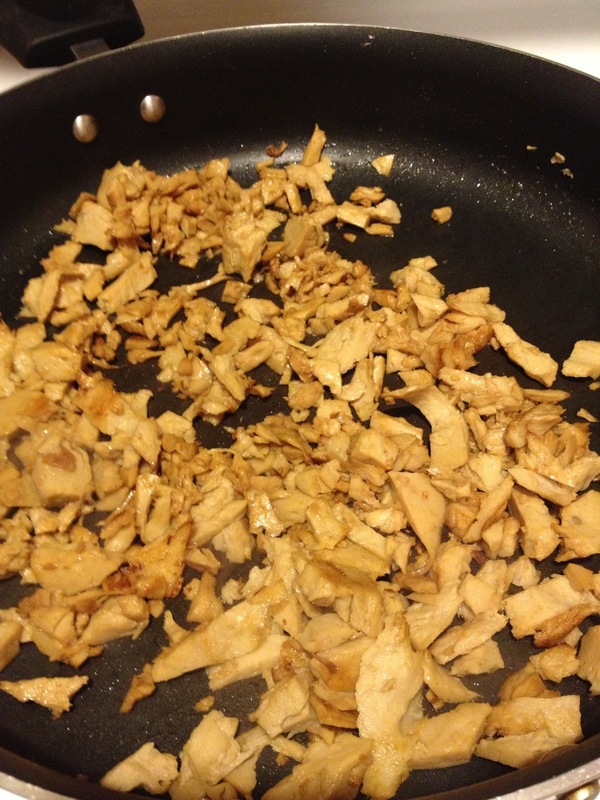 Crumble the tofu in the pan and keep heat at medium or lower. Add spices and sautee gently for 10 minutes. Just when its about done cooking, add the nutritional yeast and lemon. Add water as needed throughout. 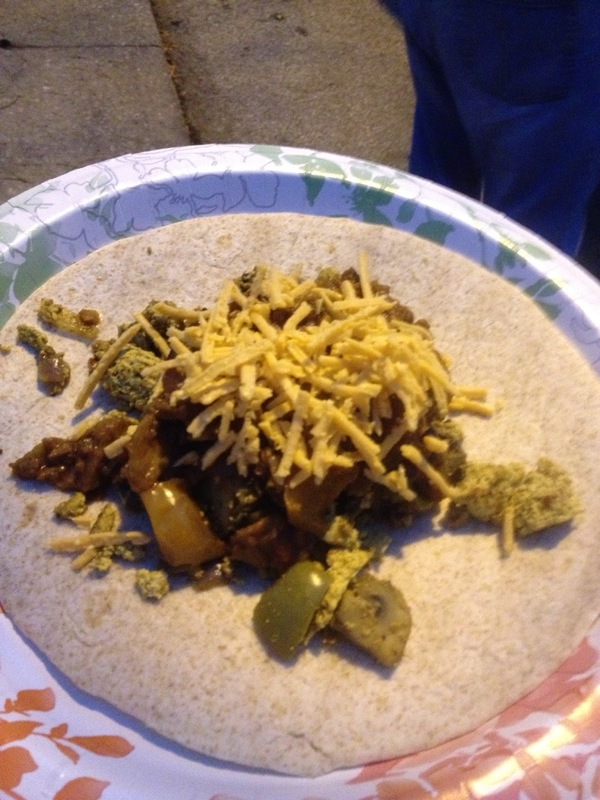 Serve on a whole wheat tortilla, with chili, daiya cheese, and any of the garnish from above. When I tell people I’m grilling they usually smirk and make some comment about veggie burgers or portobello mushrooms. 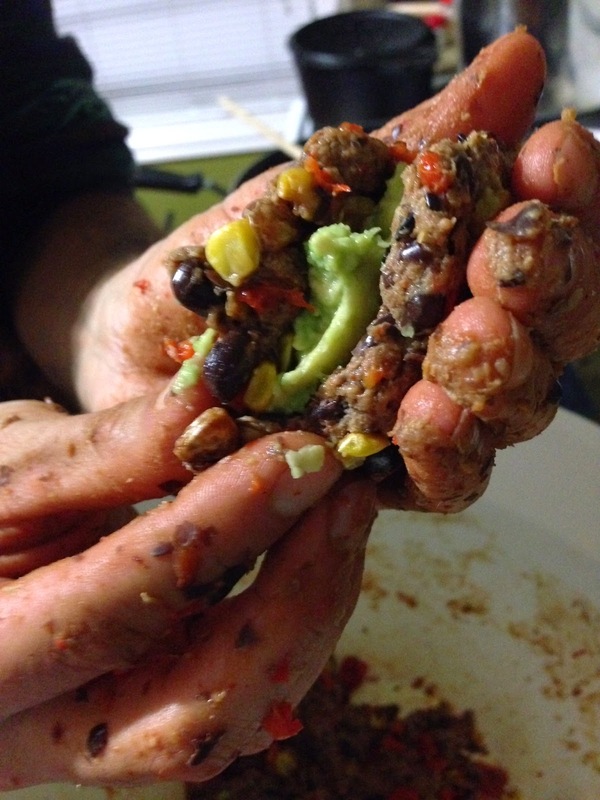 But vegan grilling is so much more that frozen soy patties. 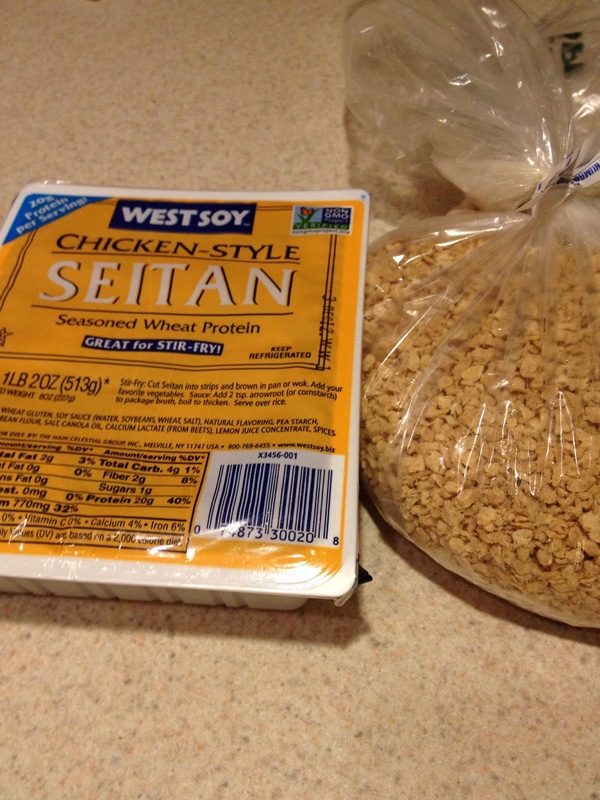 Seitan is an ancient meat-like substance made with the protein portion of wheat. When combined with liquids, it can be formed and molded then baked, fried or grilled. With added spices the possibilites are endless. It may sound a little strange at first, but it the taste and texture are very much on point. 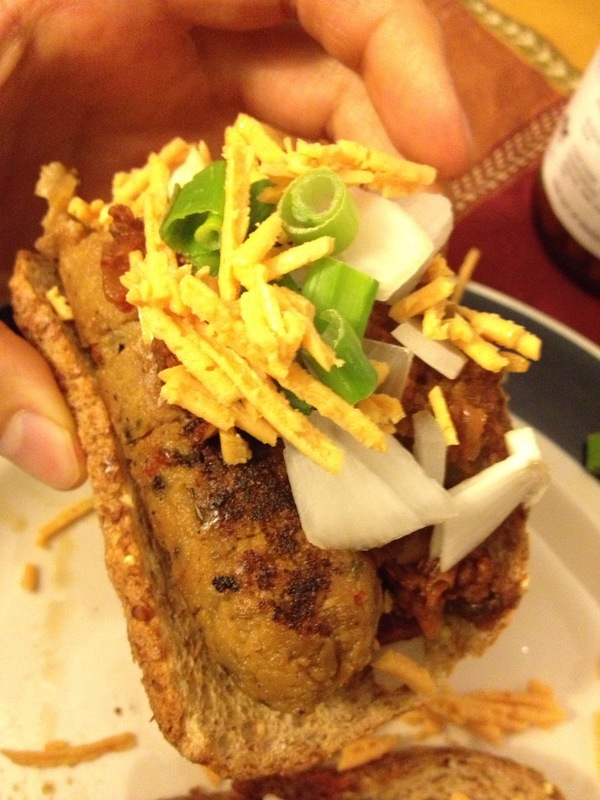 This recipe for Seitan Ribs comes from Susan Voisin at Fat Free Vegan Kitchen. Its simple to make and can be prepped ahead of time, wrapped up and made ready to throw on the grill in the parking lot. 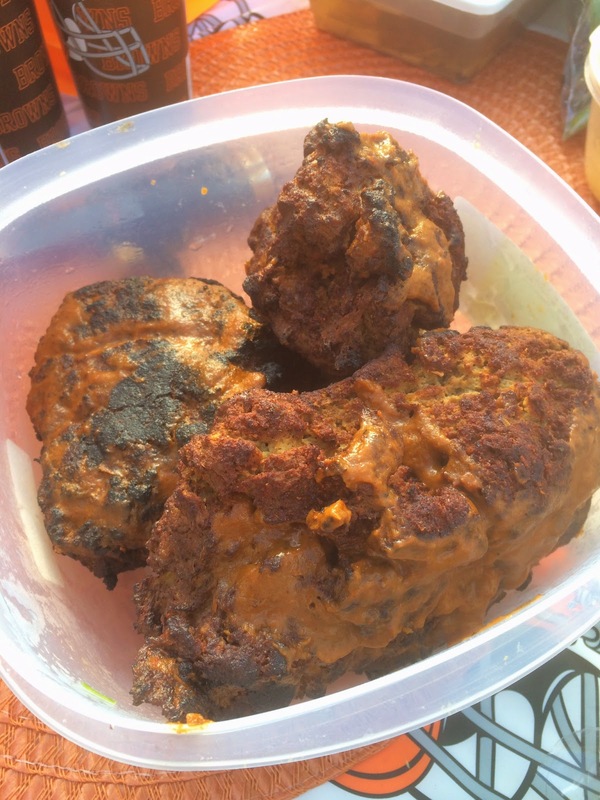 If you really wanna take it to the next level, make your own BBQ sauce. My tailgate menu for the Bills game was pretty jam packed, so I just purchased the sauce to brush on while grilling. Enjoy! Put all the dry ingredients in one bowl and mix. Put all the wet ingredients in a bowl and whisk (the nut butter is a wet ingredient). 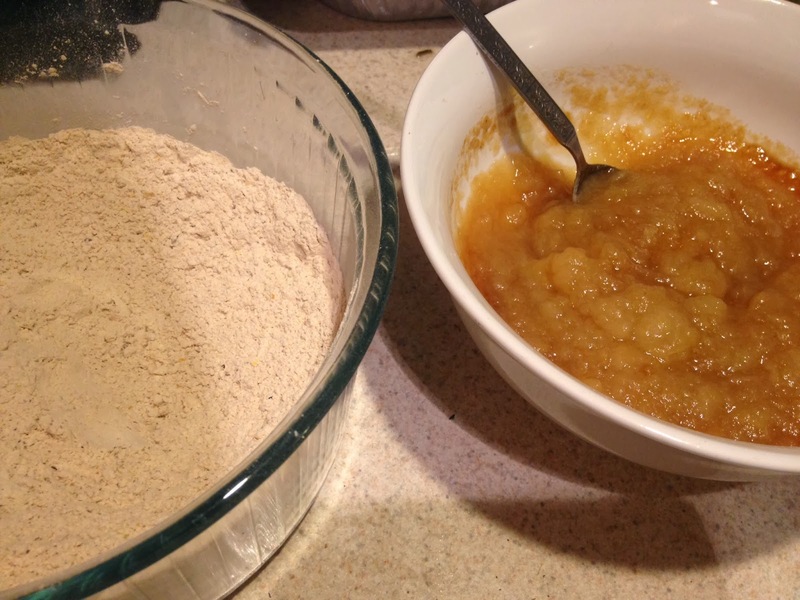 Then pour the wet ingredients in with the dry and knead with your hands for a couple minutes. Place in a greased 8×8 glass baking dish. 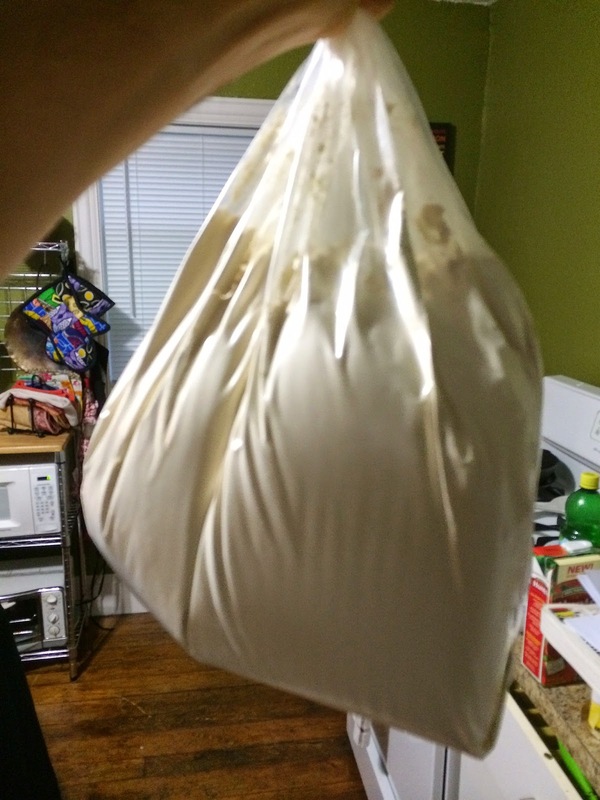 Spread the seitain to the corners like you would with pizza dough. Roughly cut the seitan into 16 strips. Bake for 25 minutes at 350. Let cool and wrap in foil until ready to grill. Toss them on the grill for 5 minutes or so each side. Brush on BBQ in the last few minutes. Enjoy! 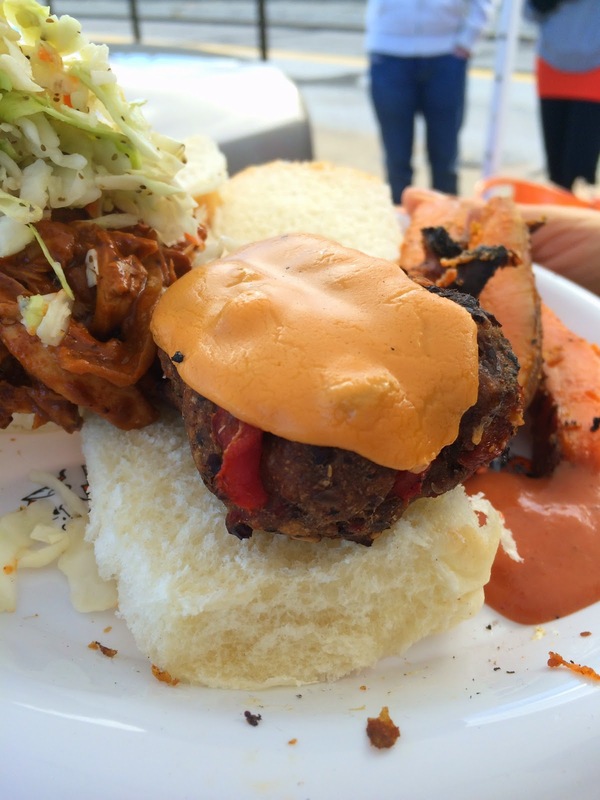 A one of a kind vegan tailgate blog. 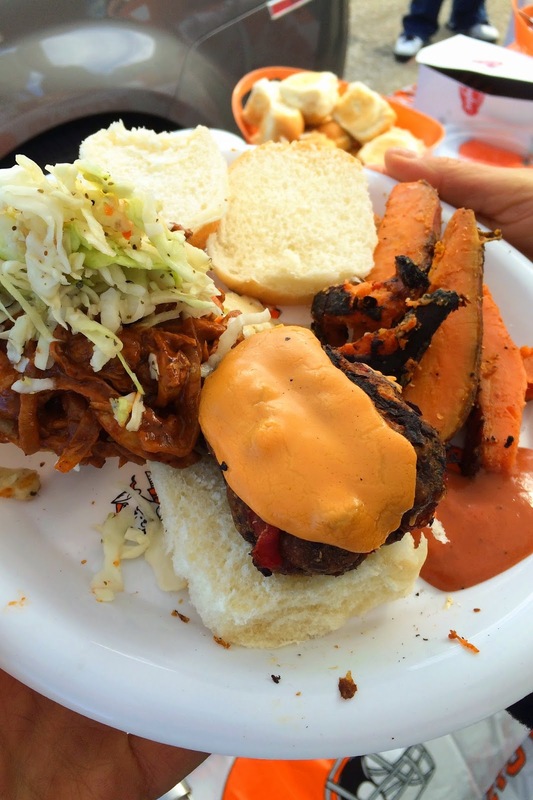 Sharing plant-based recipes and photos for the ultimate tailgate experience. At long last, @atlasmeatfreedeli in Miami! Loaded fries with garlic aioli and island mac sauce topped with atlas burnt pastrami tips and jalapeños, Buttamlk Fried Chk’n Cutlet topped with Lettuce, Tomato, Red Onion and Mayo on a toasted Pretzel Bun with a Wet & Saucy Buffalo Glaze and Island Cheesesteak Sweet Peppers & Onions on toasted Hoagie with Island “Cheese” Sauce garnished with Scallions. The pizza at @ohiopieco lived up to the hype. Sausage and buffalo chicken za because I had to try both. Incredibly crispy, garlicky and savory. Brunswick will never be the same. First time @thevanakendistrict and the amazing @brassica.sandwiches.salads! This place is heaven for a vegan. Deep dish Mac and Cheese Pizza. Mozzarella Mac, baby kale, artichoke, olives, sun dried tomatoes, homemade marinara and crust. This baby weighed 4lbs! !